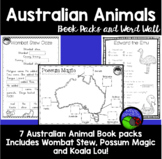 7 book packs to accompany common stories based on Australian Animals - plus a word wall file! See individual listings for included content. Each pack is designed to last a week - read one book a week and choose and activity a day for students to complete. The children create their own recipe by writing the ingredients and method on the sheet provided then draw the ingredients in the cauldron, cut it out and glue it next to the recipe. 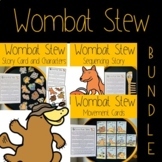 Wombat Stew is an integrated program that teaches to the Science and English Learning Areas in the Australian Curriculum. 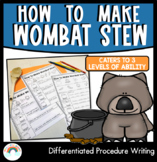 It consists of a series of detailed lesson plans and printable learning resources. 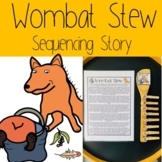 Simple grid with pictures to sequence the story Wombat Stew. Includes a developing/achieved assessment to circle. 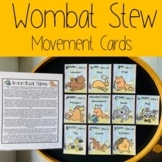 This is a shopping list that children can use to create their own wombat stew shopping list. 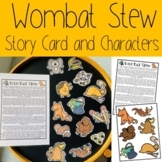 This is a sheet where the children draw and write what happened in the beginning, middle and end of the Wombat Stew story or the teacher can scribe. 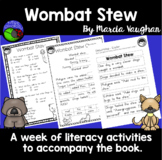 A comprehension worksheet for children to complete after reading the book wombat stew.